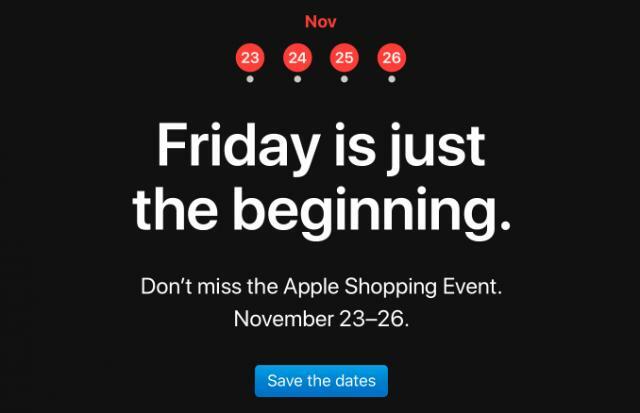 Apple sent out a mass email today promoting a “four-day shopping event” starting this Friday, traditionally known as “Black Friday” in the U.S., when retailers have special sales to begin the holiday shopping season. Apple rarely holds sales, and Black Friday is the only day where Apple has consistently offered discounts or special offers. Recently they have simply been including gift cards with purchases, so not actually lowering the price of products, but making it easier to outfit your new purchase with accessories. We’ll have to see if this year is any different. Perhaps each of the four days will bring slight different offers. I purchased a new MacBook Air on November 15th. Had I known about this sale I would have waited! Is there a way I can participate in this sale, even a week late? Annemarie: I don’t think so. It is like any other sale. And you don’t know if your particular MacBook Air in your particular situation will qualify anyway. It may depend on what state you live in. Several states have laws that allow you to get the sale price of an item if you purchased it within the last 30 days. You may find that all you need to do is take your receipt to an Apple store or contact someone on line. Since it is within the 14 daay return policy, I feel they will refund the difference. The logic is the customer can return the machine and buy another one at the sale price. Just give them a call and request a refund for the difference. Let us know the outcome. I think one of the issues may be that the “price” is going to most likely be the same. But the “sale” will be that you get a gift card. That’s how they usually do it. So not sure how it will work trying to get them to match the price — since the price is technically the same. Annemarie — please let us know how it goes!